The 2012 Bentley Continental GT V8 offers a moral hazard for foolish plutocrats—and not just by dint existing in the first place. Nope, it's the new twin-turbo V8 engine (which lives a less glamorous life in an Audi S8) that's a puzzle box for the moneyed ego: Do you buy the W-12 version, with slightly higher horsepower but lesser gas mileage and greater weight; or do you do the smart thing and get the wildly more fuel-efficient V8 engine despite its smaller displacement and mathematically indisputable fewer cylinders under its wide, leonine nose? That Bentley is offering the old W-12 at all is a weird joke (one they'll be only too happy to relate to the teller when they take some simp's money to the bank) but Bentley promises they will continue to develop the W-12 in further iterations. Yet not only is the Continental GT's V8 more than powerful enough to propel the car to sub-five-second 0-to-60 times, it's lighter, too, by 50 pounds. 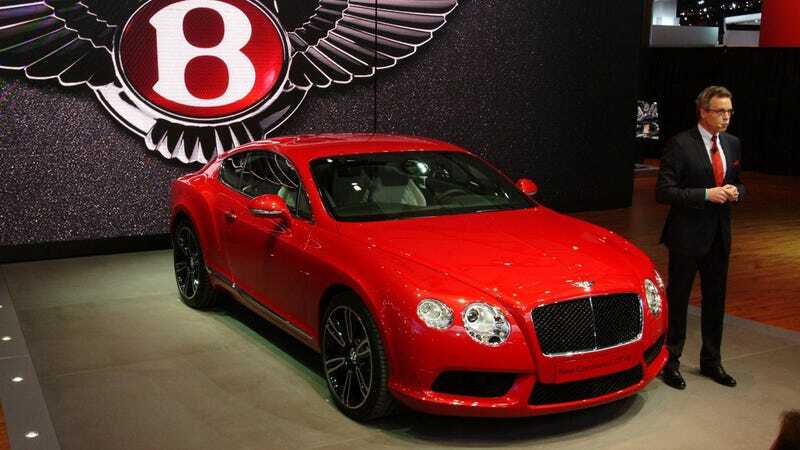 There's a special red Bentley badge to evoke its "racing pedigree". (Never mind that red is just snazzy.) It even has an exclusive "New Dark Fiddleback Eucalyptus veneer," making it surely the best smelling car I'm going to see at this year's Detroit Auto Show. But it's not the weight that makes the GT V8 500HP chugger more efficient on the long lope—it's the fact that it shuts down four of its eight cylinders while cruising, putting its MPG into a range that will still singe the armpit hair of aggrieved bicyclists (just 23MPG or so on the highway) but at least offers a far greater range on a full tank—up to 500 miles. If you're in the market for a $200,000 two-door tourer, how could you pick anything but a throaty V8 with 40% more range? It's not that you couldn't afford the extra gas, of course; it's that you can't afford the time it'd cost you for an extra fill up.